In the eleventh century, Anselm of Canterbury wrestled with the question, Cur Deus homo? (Why did God become a man?). His book-length answer is still a classic. Our Lord Jesus gave his own pithy answer in Luke 19:10, “For the Son of man came to seek and to save the lost.” What does our Lord affirm here? So when Jesus calls himself the Son of Man, he does much more than identify himself as having a human nature. He reveals himself as God incarnated as the Last Adam, the true Man, the Man of God’s right hand, the Messiah, the King, the Savior, Lord, and Judge! Compare Daniel 7:9–14 and Revelation 1:12–18. It’s an amazing claim. 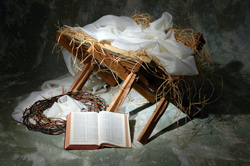 Even more amazing is Jesus’ claim that “the Son of Man came.” A few years ago, PBS aired a program which claimed that Jesus was just a good teacher. It alleged that later Christians fabricated claims that he was the Son of God and the Messiah. This view was broadcast all over the country. Tragically, this same view is proclaimed from many pulpits across our land. But this is not the view of God’s Word! It is not the view of Jesus! It’s a damnable lie! Both Jesus and the Bible insist that “the Son of Man came.” It wasn’t happenstance. It wasn’t a delusion. It was a purposeful mission. That he “came” means that he came from somewhere. God’s Word explains: “In the beginning was the Word, and the Word was with God, and the Word was God” (John 1:1). “ ‘I tell you the truth,’ Jesus answered, ‘before Abraham was born, I am!’ ” (John 8:58 NIV; compare Ex. 3:14). Before he was conceived and born, Jesus existed eternally as the second Person of the Godhead. That should never cease to amaze us! “The Son of Man came.” Without ceasing to be God, God really did become a man! It’s a huge mystery, a wonder-filled mystery, but it’s true. Some people reject the miracle of the virgin birth as too incredible, yet claim to believe in the Incarnation. But the Incarnation was the most miraculous of all miracles! If you believe in the Incarnation, it should be easy to believe in the subsidiary miracle of the virgin birth. The Incarnation is the most mysterious of all mysteries! It involves the triunity of God, one God existing in three Persons. It also involves the “hypostatic union,” the union of two natures (divine and human) in one person, the Lord Jesus. “And the Word became flesh, and dwelt among us, and we beheld His glory, glory as of the only begotten from the Father, full of grace and truth” (John 1:14 NASB). The Son of Man came! But why did the second Person of the Godhead become a man? Our text tells us why the Son of Man came to this earth: “to seek and to save the lost.” The Son of Man did not come just to see what it’s like to be human. The Son of Man did not come just to impart knowledge or to show compassion. The Son of Man came to meet our central need. We need all sorts of things—important things, like peace, security, education, prosperity, happiness, and companionship. But none of these things is our central need. Our central need is for salvation, since we’re lost. That’s the root of all our problems. Above all, being lost means that we are separated from God. Sin creates a great estrangement between us and the God who created us. Our corruption, on the one hand, and God’s holiness, on the other, keep us apart. The Bible doesn’t mince words about this. It says we’re “lost,” “enslaved,” “blind,” and “dead.” Furthermore, when we’re lost from God, we’re lost from everything. When that girl lost her relationship with her parents, she lost her relationship with everything. This helps us understand how it is with us. Every problem of alienation that plagues us—our social alienation, our psychological alienation, our ecological alienation—is rooted in our religious alienation, our alienation from God. We’re lost! We need to be rescued! And the great news is that God became man “to seek … the lost.” Salvation is not first of all my seeking and finding Christ. “As it is written: ‘There is no one righteous, not even one; there is no one who understands, no one who seeks God’” (Rom. 3:10–11 NIV). Both Scripture and experience confirm that, left to ourselves, we sinners will look anywhere and everywhere except to Jesus Christ! On the other hand, the Bible again and again pictures God as seeking sinners. For example, Jesus depicts God as a shepherd seeking a lost sheep (Luke 15:3–7), a woman seeking a lost coin (Luke 15:8–10), and a father seeking a lost son (Luke 15:11–32). Salvation isn’t first of all my seeking and finding Christ. It’s first of all his seeking and finding me. Thank God, Jesus Christ came not merely to make salvation possible for the lost, but “to save the lost!” His life, death, and resurrection literally guarantee the full salvation of all those for whom he lived, died, and rose. The living, exalted Christ personally and effectually applies his saving work by his Word and Spirit to each of his elect people. Jesus said, “All that the Father gives me will come to me, and whoever comes to me I will never drive away. For I have come down from heaven not to do my will but to do the will of him who sent me. And this is the will of him who sent me, that I shall lose none of all that he has given me, but raise them up at the last day” (John 6:37–39 NIV). Our Lord Jesus is a Savior who truly saves! The great news is that salvation—full and free—is found outside of us. It’s found in Jesus Christ—Jesus Christ plus nothing. Put your confidence only and totally in Jesus Christ, the Son of Man, God incarnate. Up till now, we have passed over a word—the little word “for” at the beginning of our text: “For the Son of Man came to seek and to save the lost.” That word indicates that Jesus is explaining why he did something. Luke 19:1–10 relates what Jesus did. He graciously singled out a lost sinner, Zacchaeus, and rescued him from sin. In response to Zacchaeus’s confession of faith and repentance, “Jesus said to him, ‘Today salvation has come to this house, since he also is a son of Abraham. For the Son of man came to seek and to save the lost’ ” (Luke 19:9–10). Jesus sought and saved Zacchaeus because that was the very reason he became flesh. Evangelistic, missionary passion welled up in Jesus’ heart. He came for that very purpose—to seek and to save the lost. That is our hope. That is our salvation. We were like Zacchaeus, without hope and without God in the world. Then the Son of Man came and sought us and saved us! How then can he be anything other than our deepest passion and our foremost mission? Let us therefore renew our commitment both to know and to make known the Son of Man.